Only 17 miles (27 km) from the coast of Venezuela, Aruba is the smallest of the "ABC islands" (Aruba, Bonaire, Curaçao) of the former Dutch Antilles [see area map]. 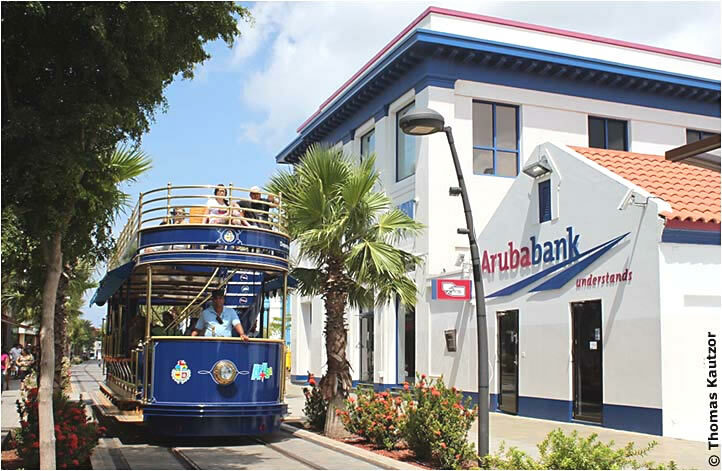 Since 1986, along with Curaçao and Sint Maarten in the eastern Caribbean, Aruba has been one of four 'countries' that comprise the Kingdom of the Netherlands. Population in 2010 was 101,484. 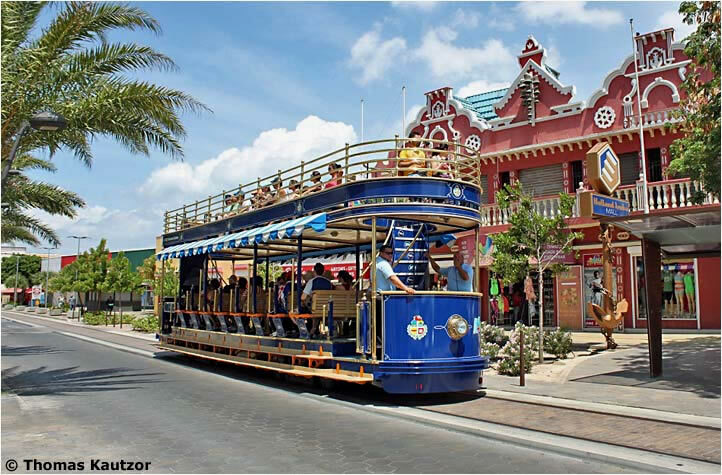 A third of its residents live in its capital city, Oranjestad. The island's official languages are Dutch and Papiamento, but English is spoken at hotels and shops. 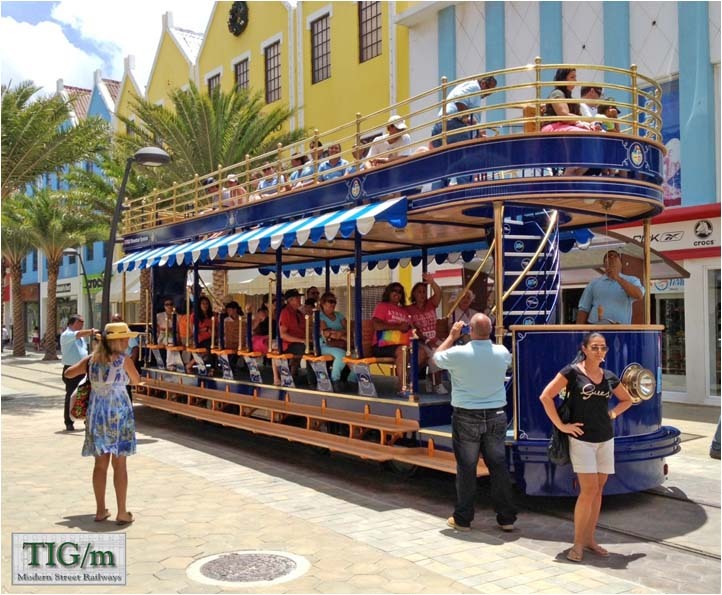 Three-fourths of Aruba's GNP today comes from tourism. 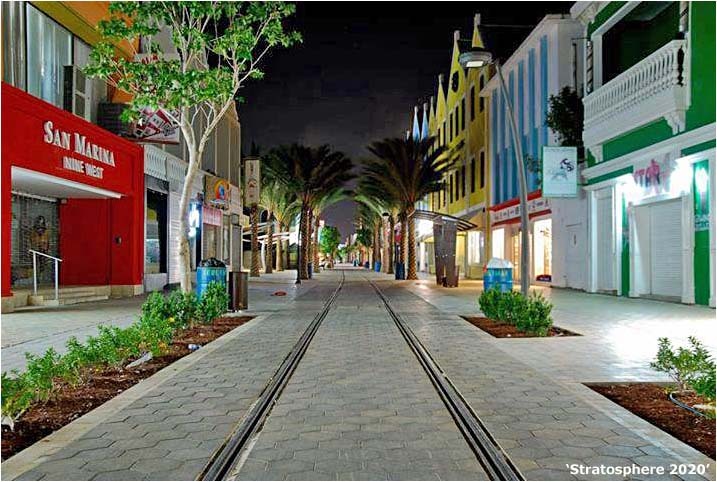 Unlike Curaçao, Aruba never before had a railway in a street. But it had several industrial lines scattered about the island. Its first railway opened about 1850 at a gold mine near Balashi. A phosphate mine laid a railway at the southern tip of the island in the 1880s. Lago Oil opened the first section of a rail network around its refineries at Sint Nicolaas in 1928 and, about the same time, Eagle Oil established a refinery and rail lines near Oranjestad. Lago was one of the world's largest producers of aircraft fuel and both the Lago and Eagle installations were torpedoed by German submarines in 1942. One of the Eagle Railway lines ran until 1960 to a wharf near where the streetcars run today [see city map]. 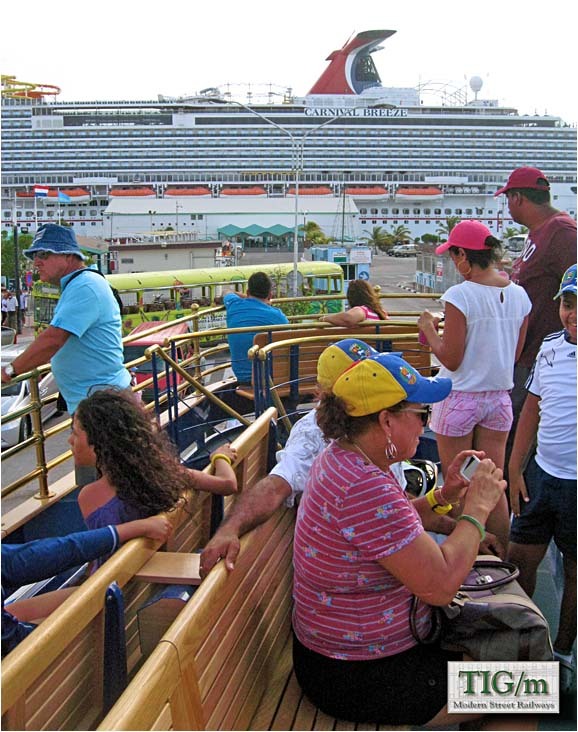 As its petroleum industry declined, Aruba concentrated on tourism. 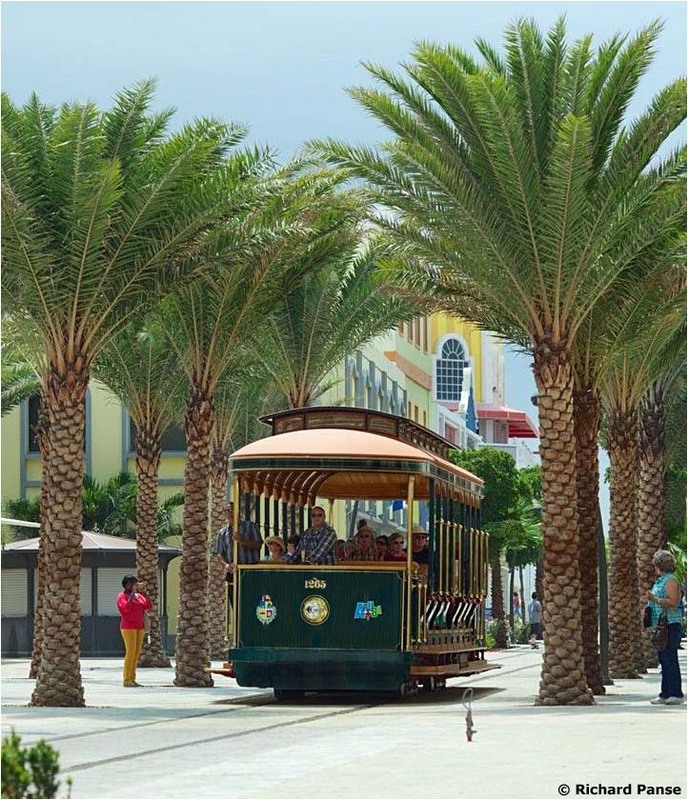 Its white sand beaches were extended, the airport and dock facilities were enlarged, and a battery-powered streetcar line was built from the cruise ship terminal down the capital's main street, which was converted to a pedestrian mall. 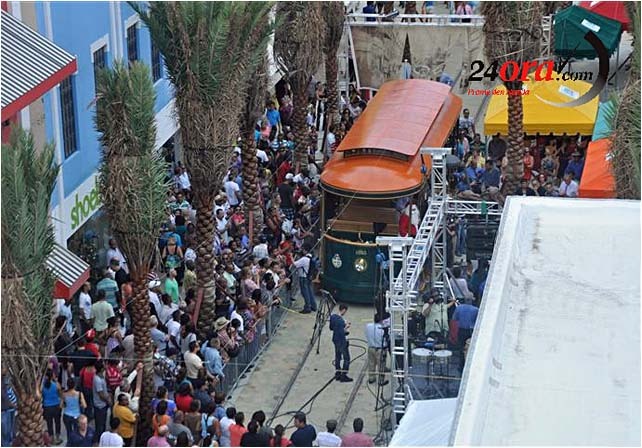 The line was inspired by the popular battery-powered streetcar operation at The Grove in Los Angeles, U.S.A. 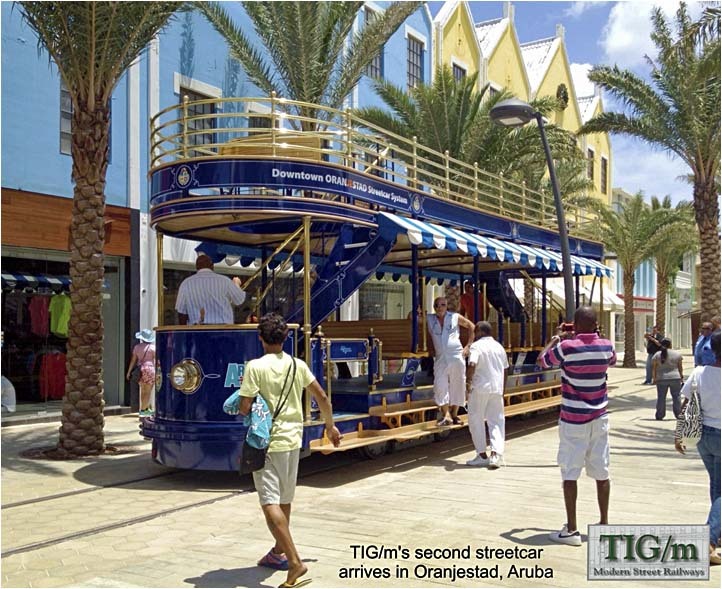 In 2010 Aruba's Minister of Infrastructure Benny Sevinger visited the California factory of TIG/m, the company that had designed the Los Angeles car, and before long TIG/m was constructing two streetcars, a single- and a double-decker, for Aruba. 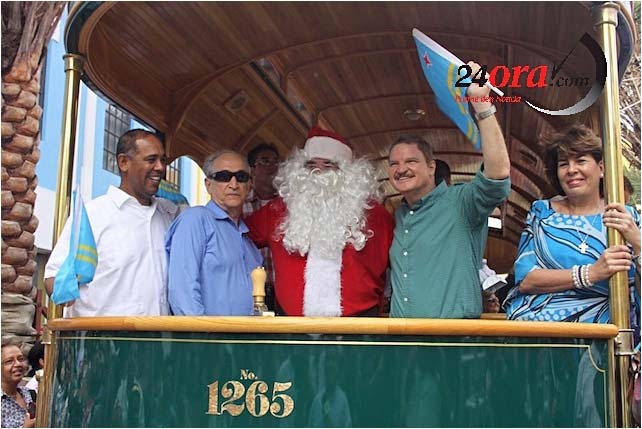 In 2012 Prime Minister Mike Eman signed an agreement with Sir Richard Branson, founder of the Virgin enterprises, the Carbon War Room and other organizations, to make Aruba the world's first 100% 'green' economy by 2020. 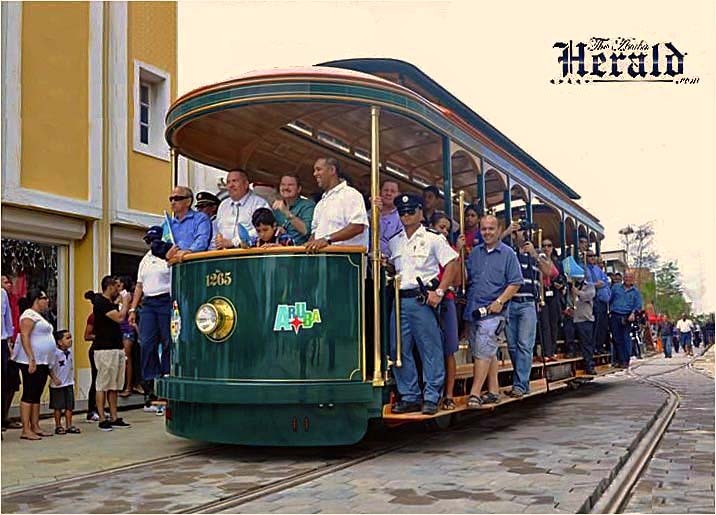 Aruba's streetcars are powered by batteries augmented by hydrogen fuel cells, which in turn are powered by the island's year-round trade winds. 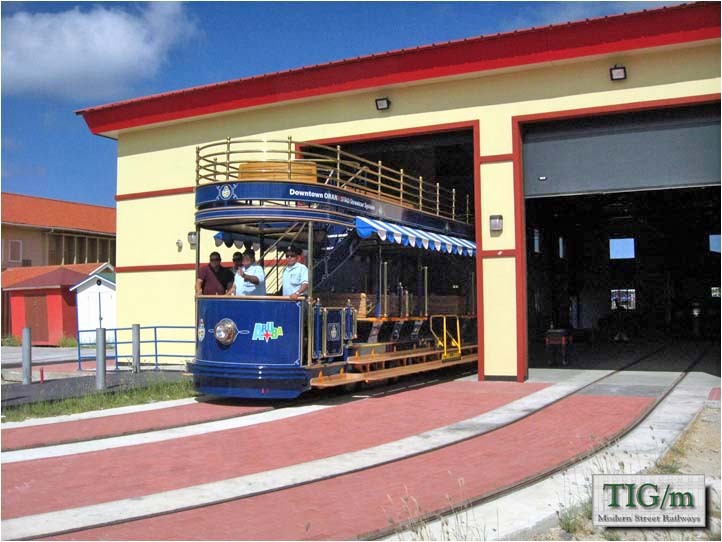 Arubans claim that they are the first in the world to use hydrail technology in regular passenger service. The vehicles are bidirectional and use PCC type B2 trucks that were manufactured in the last century by Clark Equipment Co. for streetcars that ran in Boston and Shaker Heights, Ohio. 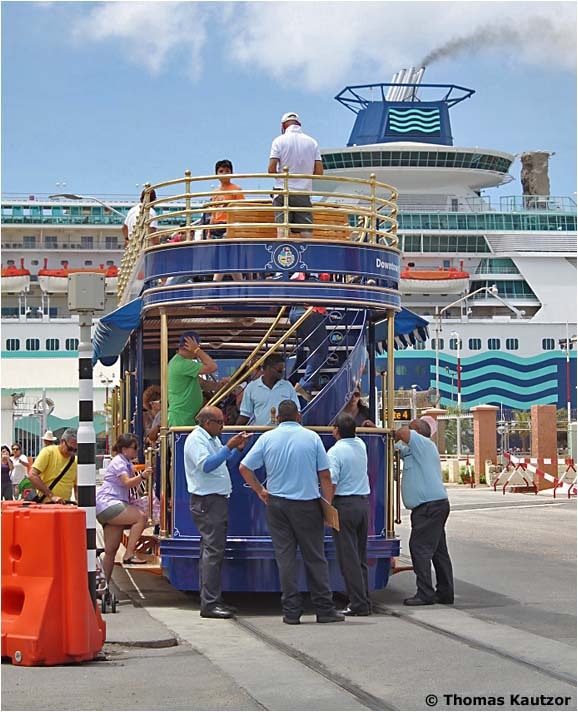 TIG/m re-machined the wheels to conform with the Ri59 rail laid in Oranjestad. 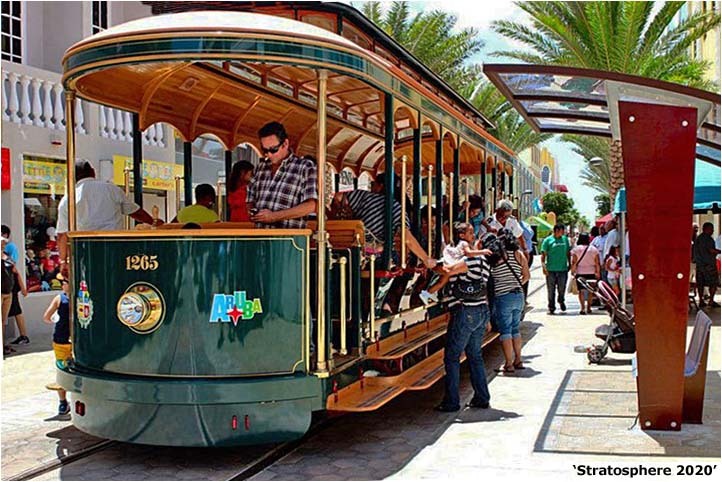 In 2014 streetcars were running daily 10 am to 5 pm, with a car starting from each end of the line every 30 minutes. When more vehicles arrive soon, headways will be reduced to 20 minutes. as the streetcar line develops. See a YouTube video made on 3 October 2013. Lee A. Dew. The Railroads of Aruba and Curaçao / Railverkeer op Aruba en Curaçao. 108 pages, Rotterdam, 1977. The principal source of information about the rail history of the islands. Text in English and Dutch. Photographs and maps. Allen Morrison. Battery Power. Webpage charting the history and development of the battery power used on streetcars 100 years ago. 'Hydrail – The Green Transport Solution We've All Been Waiting For?' in railway-technology.com, 21 June 2011. Pioneer article about the new technology. 'kearthfan101'. 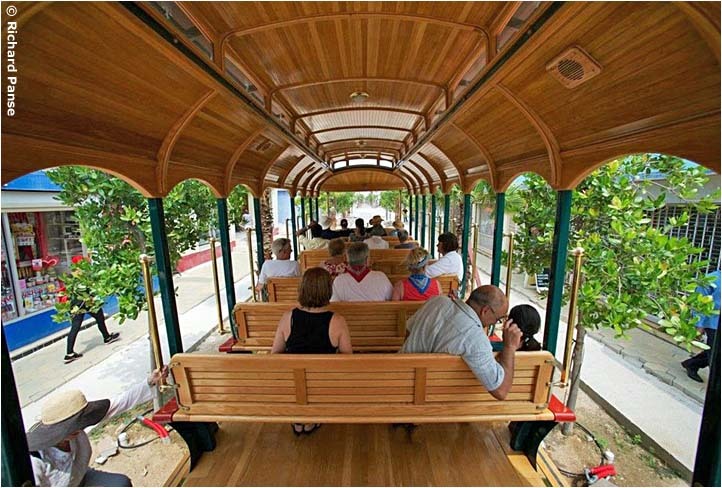 The Grove Trolley. YouTube video of the battery-powered streetcar line in Los Angeles. Nice HD image quality. 7 minutes 21 seconds. 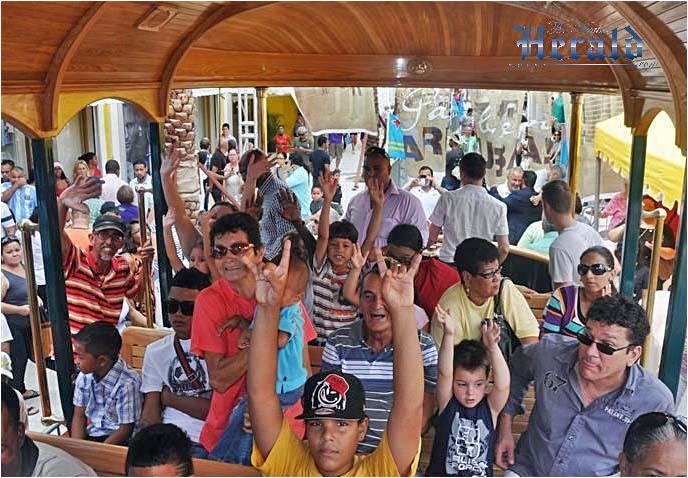 Arubus, the local bus company which operates the streetcar, solicited applicants for motormen on 1 February 2013. 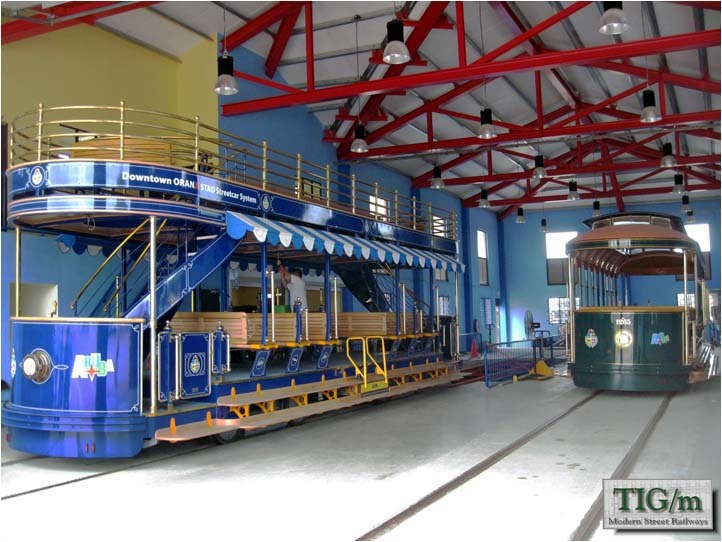 Tramcar - Grand opening ! Oranjestad-Aruba-Caribien. A YouTube video made in March 2013, when the line was still under construction. 5 minutes 43 seconds. 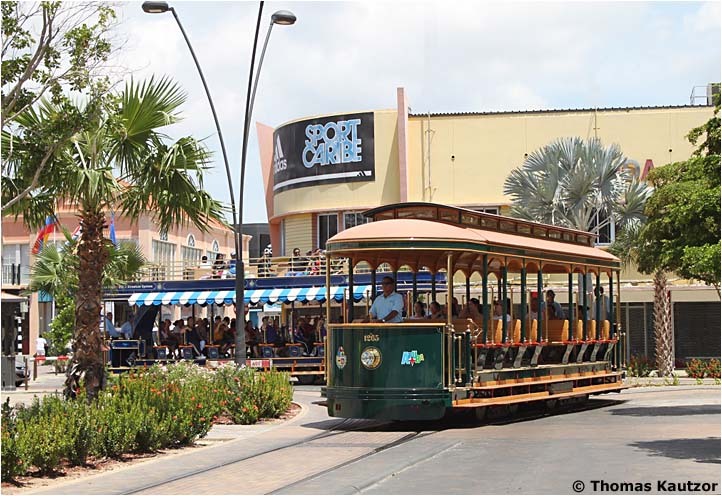 'TIG/m Modern Street Railways Delivering World's Greenest Streetcars to Aruba in Island's Transition to 100% Sustainability' in altenergymag.com, 27 March 2013. Stan Thompson. 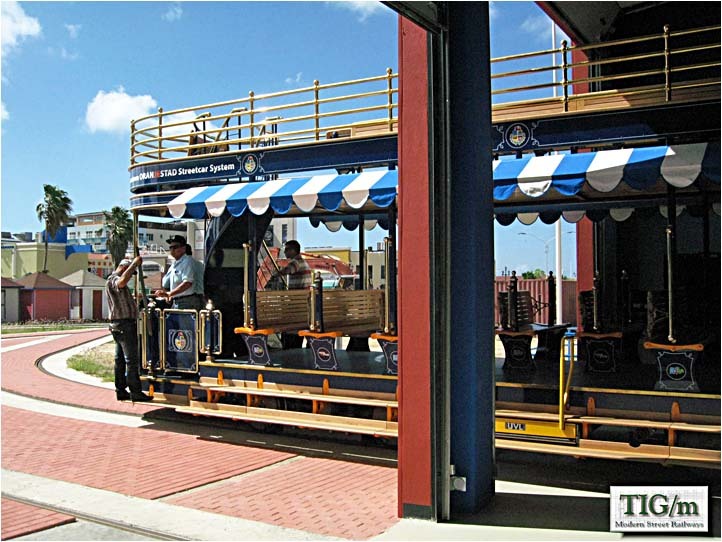 'Aruba to Debut 1st Hydrogen Streetcar Fleet' in hydrogencarsnow.com, 1 April 2013. Excellent short description of the Aruba project. Thompson is a prominent promoter of hydrail. 'International Hydrail Conference', June 2013 in Toronto, described at hydrail.org. Information on the meeting and links to many articles. The 'Hydrail' page in Wikipedia supplies good historical material and references to other articles. Aruba has numerous daily newspapers, but most publish only in the Papiamento language (which Google Translate does not translate). 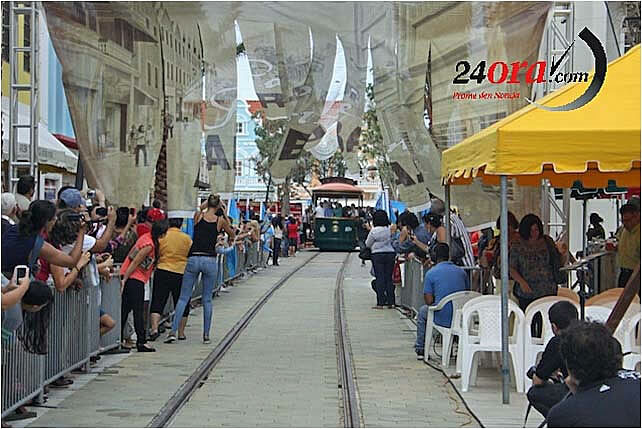 For streetcar news the most useful periodicals are Aruba Herald, Diario, and 24ora.com. 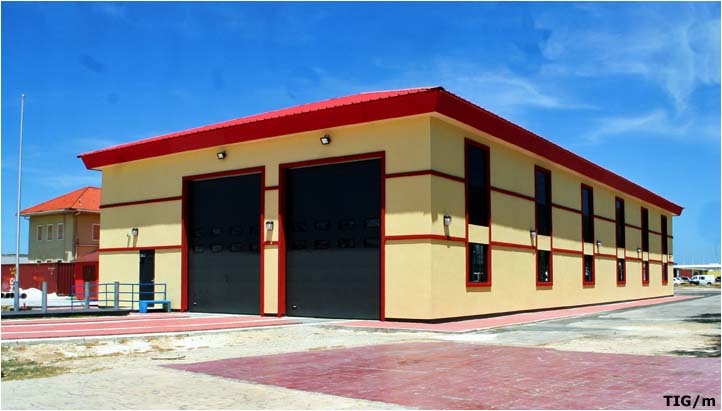 Aruba | Projects & Economy | Proyectos y Economía. 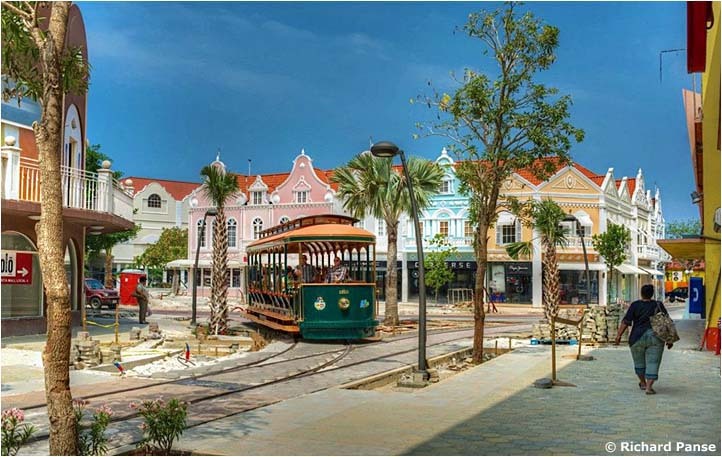 This SkyscraperCity forum is often the best source of information about current developments in Oranjestad. In addition to the works noted above, the author is indebted to Bradley Read, president of TIG/m, for supplying most of the background information and many of the photographs shown on this page. The author also wishes to thank Thomas Kautzor for the illustrations and map data that he provided in 2014. 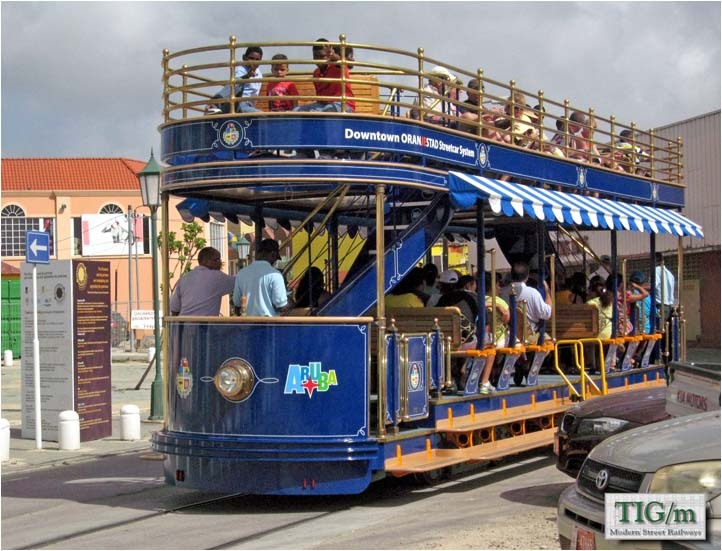 If you have comments, criticism, suggestions, or good photographs of streetcars in Oranjestad, please e-mail me!